At Procurehere our ambition has always been to ensure a simple subscription system that helps meet our customers’ unique business needs, whether that’s for an iconic multinational or an ambitious young SME. That means all the opportunity of our simplified e-procurement system set up by anyone, anywhere in the world, in just 3 days. Procurehere helps unlock a wide range of financial and operational savings for your business. We’re proud to have saved over US$1.3 billion for our users to date, but realising those savings requires an accessible, affordable e-procurement solution that’s easily embedded in a business at any stage of its growth cycle. 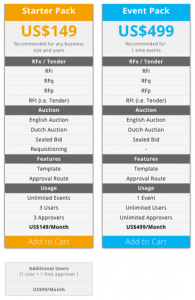 US$149 per month unlocks access to Procurehere’s wide range of RFx, Auction and Requisitioning functionality for up to 3 users and 3 approvers. Suitable for organisations of any size, and ready to scale up to meet the requirements of a growing business. User-friendly signup and set up alongside affordable pricing makes this the simplest, most readily adopted e-procurement solution on the market. At just US$99 per month, additional users can be quickly added to your Procurehere subscription, providing a platform where your own opportunities grow with your business. US$499 one-off payment provides access to our unlimited user single event pack. Unlock the value of e-procurement to deliver huge potential ROI on your subscription for one key event. This option is perfect for customers running a one-off auction or tender and looking to access the significant savings made possible by our e-procurement solution. “We conducted a reverse auction on Procurehere for the construction of a wharf and access bridge that was awarded at a cost saving of close to RM18 million. This was just one event, and we run more than 80 events a year.” – Ahmad Damanhury, Head of Civil Engineering, Westports. The substantial value of e-procurement comes from providing a powerful platform for both buyers and suppliers. Our simple supplier subscriptions and signup mean that unlocking that opportunity is easier than ever. Link up with a single key customer through our Single Buyer supplier subscription. Just US$30 per annum allows you to access unlimited events from one single key buyer. Open up a global opportunity of accessible tender and e-procurement events. Just $199 per annum provides unlimited access to all relevant events hosted on Procurehere.